I am a cancer free, survivor patient treated with IPT/IPTLD. Testimonials: DETOXIFICATION TREATMENTS WITH I.P.T. Feeling Toxic? We all need a Detox now and then, to clean and purify our body from all the contaminants we’re constantly exposed to. When we feel intoxicated, our energy leves go down, we’re irritable, don’t eat or sleep well, thus affecting our quality of life. 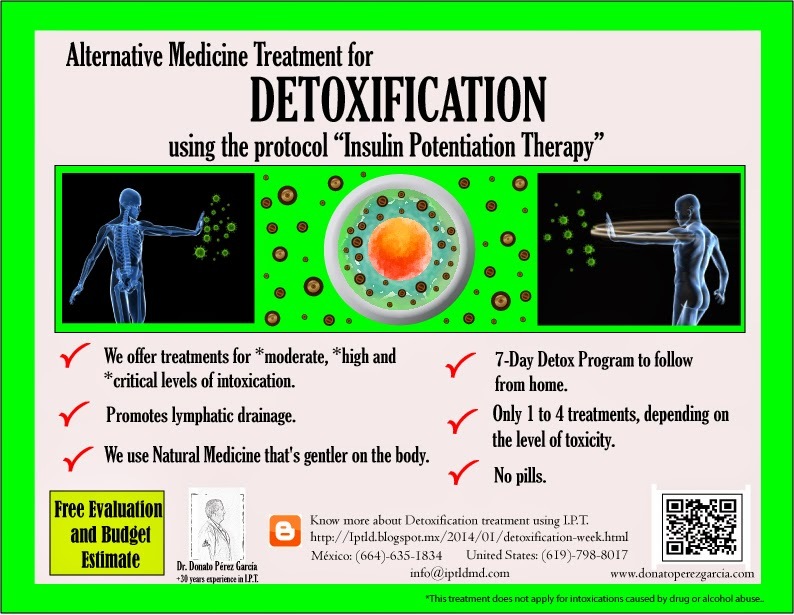 The IPT Medical Team of Dr. Donato Perez Garcia, offers high quality detoxification programs* for moderate, high to critical levels of intoxication, caused by toxic environmental exposure, heavy metals in the system, as a result of a chronic illness, long periods of medication intake or due to poor healthy lifestyle. The best selection of Natural and Biological Medicine combined with the “Insulin Potentiation Therapy” delivery system for maximum results, administered and supervised by Donato Perez Garcia, M.D. Our treatments are very affordable, there are no adverse effects, no pills, plus we offer a 7-Day Detox Program to follow from home, as courtesy. Start your Detox TODAY! Please contact our I.P.T. Medical Team to start your free medical evaluation and budget estimate. * THESE DETOXIFICATION TREATMENTS DO NOT APPLY FOR PATIENTS WITH DRUG OR ALCOHOL ABUSE.